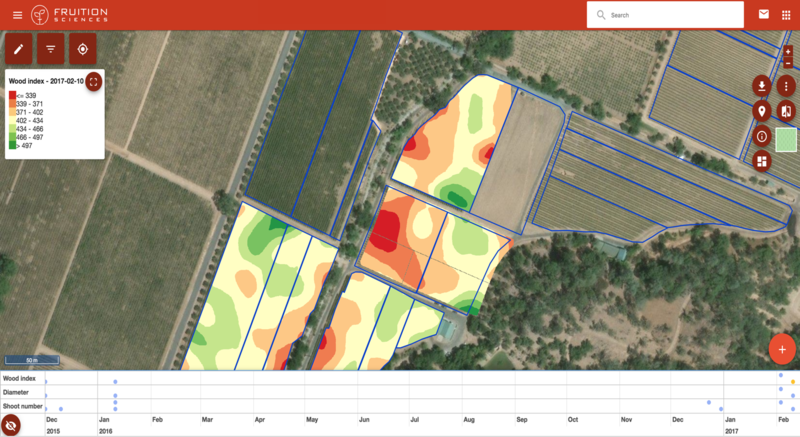 An NDVI aerial view maps and analyzes the vineyard from “above” the canopy. Thus, it provides information on leaf biomass. By contrast, a Physiocap® view analyzes the vineyard from “underneath” the canopy and maps the distribution of wood mass in your vineyard. Performed before budbreak, Physiocap® measurement informs on the number of shoots per vine and their diameter. It also generates a wood index, i.e. the section of wood produced by all the shoots and per unit of soil area. How can this information become strategic for the productivity and sustainability of your vineyard? The “Physiocap®” maps are used to assess the level of reserves available for the vine and stored in perennial and lignified structures such as shoots, trunk or roots. In practice, all these structures together are called “wood”. Studies have established a link between reserves (starch and nitrogen) which are stored in the “wood” and the growth of leaves and fruit. The results show that monitoring those reserves at dormancy provides an early indication of yield and growth potential for the following season. Why measuring before budbreak? Between bud break and flowering, starch reserves in the “wood” decrease by more than half. By using these reserves, vines increase shoot growth rate and the number of flowers. Therefore, the mobilization of starch and nitrogen reserves from the “wood” influences the development of leaf area and flowers with direct consequences on fruit ripening and yield. As such, it is important to assess the level of reserves before they begin to be used, that is, before budbreak. How to refine pruning practices? Physiocap® helps growers understand the variability of wood accumulation to further improve pruning strategies. One of the objectives of vine individual pruning is to balance the number of growing points (i.e. buds) left on the vine according to the amount of wood reserve. Criteria defining the number of buds left after pruning also varies according to vineyard productivity objectives. As such, refining pruning criteria needs to account for vineyard spatial variability in wood biomass for a given yield target. In practice, establishing different pruning criteria is a powerful practice to homogenize vine growth rates across contrasted vineyard areas. It is also a mean to adjust yield and quality performance according to vineyard wood reserves. In this context, it is relevant to characterize the spatial distribution of wood reserve to support the definition of pruning criteria. From there, different pruning techniques can be applied to modify the number and diameter of shoots by reducing or increasing the number of buds per vine. Physiocap® maps reveal how pruning practices can affect vineyard homogeneity and show how it is possible to be more effective from one year to the next. The monitoring of wood biomass in the vineyards is also essential to ensure the sustainability of the vineyard’s production. This is particularly justified in the context of global warming as warmer soil temperatures accelerate the mobilization of reserves. How to sample the vineyard with more confidence? To optimize the vineyard sampling strategy, you can analyze the shape and size of vineyard areas showing uniform “wood” production. Depending on your objectives, you can assess vineyard spatial structure based on maps describing variations in shoot diameter, shoot number, or wood accumulation. Physiocap® maps show vine ability to create and store reserves. From these initial storage conditions, vines regulate their activity during growth. As such, early variations detected by Physiocap® will affect later variations seen through vine growth and fruit ripening periods. An interesting sampling strategy consists of positioning the sampling sites at the most contrasted points highlighted by the Physiocap® maps. Then, by following plant and fruit indexes variations at those points, you can more easily “frame” vineyard general response between extreme trends. Finally, it is also possible to use Physiocap® maps to extrapolate sample measurements over the entire vineyard. Why wood spatial distribution can guide sampling strategy? It is challenging to optimize a sampling scheme to characterize vineyard health status. On one hand, it is necessary to consider a lot of disparate information related to vineyard structure, climate and variations in plant and fruit health parameters. On the other hand, because of spatial variations, traditional measurements can be too expensive and time-consuming to give a complete picture of vineyard performance. There is therefore a trade-off between reducing the number of measurements to reduce the cost of data collection and obtaining sufficient measurements to obtain reliable sampling. Therefore, scientific research has investigated how the number and location of sampling sites can improve the representativeness of the vineyard as a whole. In other words: “How to optimize the accuracy of vineyard representation from a few sampling points?“. An acceptable level of representativeness means that the “error” between the “real situation” (if one could sample each and every vine of the vineyard) and “the estimate” (from a small number of sampling sites) is small enough to have no impact on practical decisions. One of the main conclusions from sampling optimization studies is that sampling methods give better estimates when sampling points are located in the most contrasted vineyard areas. This is exactly what a Physiocap® map helps to identify. plant ability to maintain productivity and ripen fruit. Results have shown that carbohydrate levels in the trunk vary considerably from season to season. This highlights the importance of practices and climate on the carbohydrate reserve level. For instance, authors have shown that lower starch concentration in the trunk can be observed after pronounced water deficit, which can result in a yield decline. Therefore it is important to follow irrigation practices effect on carbohydrates reserves to sustain vineyard production. After each season, it is useful to assess how climate and practices change vine’s ability to restore and maintain the level of carbohydrate reserves. Especially during the pre-veraison period which is critical for building up reserves, it is important to watch carefully water deficit variations. The intensity of water deficit will affect vineyard production level via its effect on reserves constitution. Especially with high-yielding vineyards, too severe water deficit levels may result in starch concentration decline in vegetative organs, which will reduce yield. Rotundone, an essential aroma with peppery notes, is found directly in the berry skin and in the resulting wine. Some winegrowers like to focus on the aroma of “pepper” for the complexity it brings to wine, as reported in some blogs. In order to determine practical ways to map the rotundone’s spatial variability before harvest, a study was carried out in a vineyard in the south-west of France. Researchers first evaluated the spatial variability of the vineyards using a Physiocap® map, similar to Figure 1. Figure 1: Mapping the wood index with Physiocap® in the 360viti platform (color changes from red to green as the wood index increases). Then, researchers used the wood index map to select the most contrasted sampling sites composed of 50 vines each. From each sampling site, rotundone was measured in the wines obtained by microvinification techniques. Results showed that rotundone concentration was more than 50% higher in wines made from areas where wood biomass was higher. Thus, a link exists between the spatial distribution of wood accumulation and certain wine aromas such as rotundone. These results illustrate the benefits of targeted management strategies in the vineyard, especially selective harvesting, to manipulate wine style. Using vineyard mapping technique during dormancy with Physiocap®, is a convenient way to support the next harvest strategy. How and when to order a Physiocap® card? Our team is available to schedule a Physiocap® measurement campaign. Two solutions exist: either you buy the Physiocap® sensor and we adapt it to your motorized equipment, or we perform the measurements for you as a service. The maps are delivered in your 360viti application (formerly Fruition Analytics). Our team is at your disposal for any questions if you wish to start the experience. Thibaut holds a Ph.D. in viticulture from the French National Institute of Agronomy at Montpellier, France. His research focused on vine water status variations under dry climates and their consequences on berry ripening. Thibaut also serves as a scientific consultant for various high end vineyards in Napa Valley. Prior to his Ph.D., Thibaut worked as a winemaker for various companies throughout the world (Chile, California, France and Australia). In 2001, he was hired by Robert Mondavi winery as a research viticulturist: his projects focused predominantly on mapping the vineyard variability, analyzing vineyard practices and vine water deficit impact on fruit composition. Thibaut earned a Masters degree in Viticulture and Enology in 1997 and a Masters degree in Winemaking in 1998 from SUPAGRO, one of the top agronomy school in France. ← How to use sugar loading to support harvest decision ?